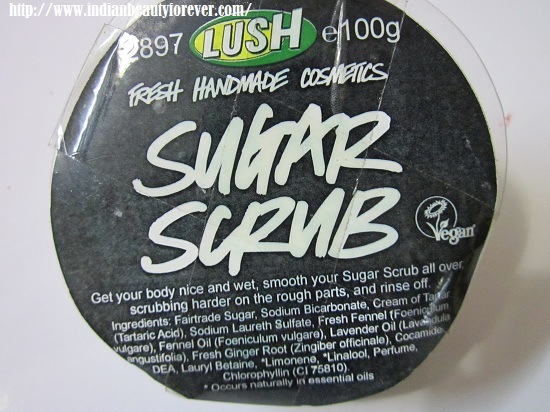 I will review Lush Sugar scrub today that I got in my vellvette box. I have used it 2-3 times and it’s an interesting product with an amazing smell that’s very refreshing and energizing. Price: It comes for 350 INR for one piece which is 100 gms. Ingredients: Sugar, Sodium Bicarbonate, Cream of Tartar (Potassium bitartrate), Sodium Laureth Sulfate, Fresh Fennel (Foeniculum vulgare), Fennel Oil (Foeniculum vulgare), Lavender Oil (Lavandula angustifolia), Fresh Ginger Root (Zingiber officinale), Cocamide DEA, Lauryl Betaine, *Limonene, *Linalool, Perfume, Chlorophyllin (CI 75810). * Occurs naturally in essential oils Vegan. Ohh.. it matches my paint.lol. 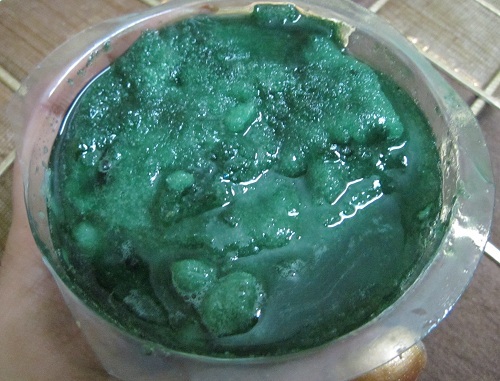 About the product: Our Sugar Scrub is hard, but a bit of a sweetie. Its no nonsense stance stimulates activity and tackles cellulite with fennel and ginger. Skin calming lavender has a balancing effect. Get yourself wet in the shower or bath, but don't let the bar get under the running water or it'll be lost before it can prove itself. Scrub, scrub, scrub and rinse away. It doesn't waste any time getting down to business. Experience: I got this Lush sugar scrub in my vellvette box and the first thing which I noticed was its smell. It smells so good that when I opened the box, it’s fragrance was all over. It is a hand made body scrub. It comes has a hemisphere in a plastic pack covered with a sticker at the top. Earlier I was not aware how to use it. It was very hard. I try to dig in my fingers to take out some, it will just not come, I tried to break a little bit of this and took it in a cup in the shower and there I used it. You have to be very careful in using this scrub as it is very abrasive and can give you rashes. I used it on the back of my hand first. It lathers less and is slimy when it does which is good as it makes the skin soft and supple. The fragrance lingers on for a long time. I would also like to mention that as it has sugar as one of it’s ingredients, so even a little water in it can make it soft paste like or rather gooey. However, that makes the usage quiet easy. this will last for around 4 usage or can depends as per the preference. Makes skin soft and refreshed. Have to be careful while using it else it can be very abrasive. 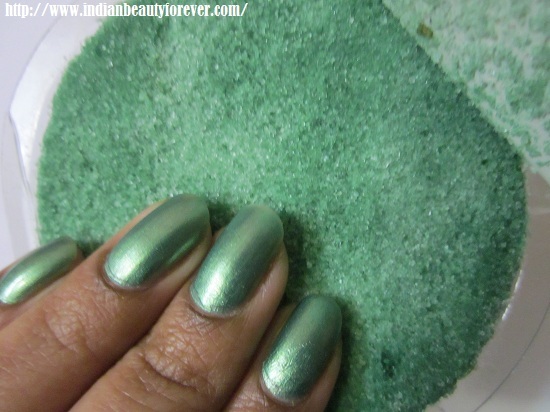 My take: Overall, it’s a good scrub but tricky to use. I usually break it into pieces before adding water so that it is not as messy. Great review Niesha! I usually like ready to use scrubs but would love to use this too. I've always wanted to try Lush's scrubs and shampoos, I've heard they're amazing! Even i want to try their shampoos. yesterday only i was browsing through their shampoo range. this will last for only 3-4 times max. I got it in sept box but have not used it then. I think it becomes easier to apply when it turns into a paste na. I really want to try Lush and this looks superb..great review.. Thank you Prachi. Hope you like it!! Wow, very interesting product :) Great review! I like your way of Post.You have defined your post every steps very clearly.I have heard about it. It's amazing.I like it's ingredients specially Lavender Oil. Thank you Abel. I like the lavender smell in it. I used something similar in the past. You have defined your post every steps very clearly.I have heard about it. It's amazing.I like it's ingredients specially Lavender Oil.Thank for post. You are right, lavender oil does make it smell heavenly i suppose.